Tuscany is for many the image of Italy. It was definitely that way for me at the beginning and in many ways remains the core of my Italian experience despite the fact that I lived in Milan for three times as long as I lived in Florence. This week, Tuscan wine producers are putting on some of their biggest events, the Anteprime in Florence, San Gimignano, Montepulciano and Montalcino of wines from Tuscany and the Buy Wine visits of international buyers to the area. The events are sponsored by the Consortium of the region together with the agency Toscana Promozione. Today at Fortezza da Basso in Florence, a large number of denominations are holding a splendid event in a beautiful location. Among the wines on offer are the following: Chianti, Chianti Colli Senesi, Chianti Colli Fiorentini, Chianti Rufina, Carmignano, Bolgheri, Terratico di Bibbona, Elba, Val di Cornia, Montecucco, Morellino di Scansano e Cortona and the Denominazione d’Origine Controllata (D.O.C.) Orcia. 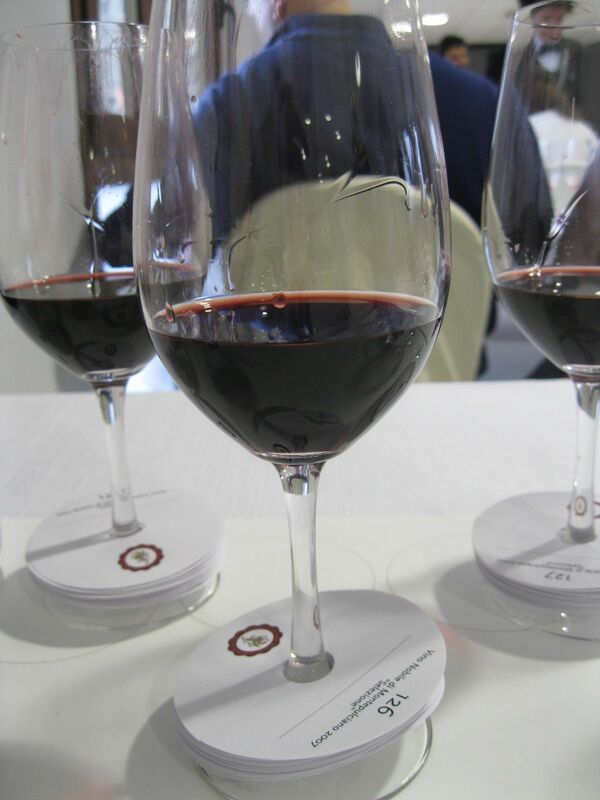 I was lucky enough to participate last year in two of the Anteprime, in Montepulciano and Montalcino. The experience was magnificent. Today I am going to write about the experience in Montepulciano where I took the above photo. For those who have never visited Montepulciano, you have a real treat in store. I have been able to spend considerable time in the area thanks to my friend Susanna Crociani, a producer of Vino Nobile. Montepulciano is a hilly town with its vineyards located at 250 to 600 meters above sea level. Some 1.300 hectares of vineyards are registered in the books and allowed to produce Vino Nobile di Montepulciano D.O.C.G. while another 389 hectares can produce Rosso di Montepulciano. It is also an ancient town and the wines have been spoken about for many centuries, as many of the old cellars in the center of the city attest to with their ancient buildings. There are about 7.6 million bottles of Vino Nobile produced annually and about 2.6 million bottles of Rosso di Montepulciano. An interesting fact is the Vino Nobile di Montepulciano was the first wine to receive the Denominazione d’Origine Controllata e Garantita (D.O.C.G.) designation on July 1, 1980. 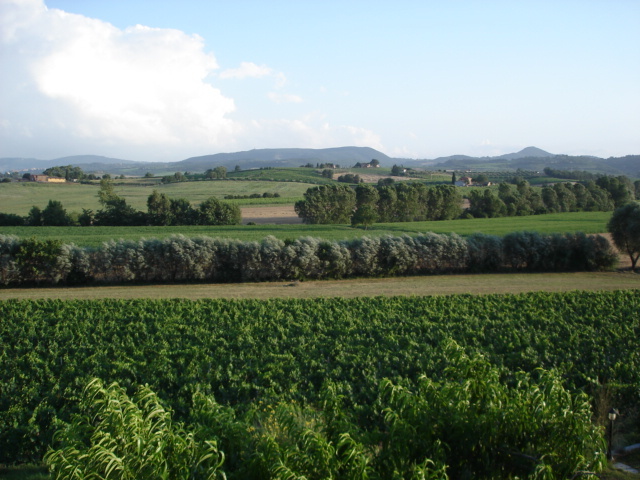 The Consorzio represents 251 producers or about 90% of the vineyards in the area. There are also 74 bottlers who are part of the Consortium. About 32% of Vino Nobile is sold in Italy while the other 68% is sold internationally. Germany is a very large market for this wine as are the Netherlands, Belgium and Switzerland. About 17% of the production goes to the United States. I am not surprised by these numbers because every time I have been in the town, it has huge numbers of German tourists coming through. What I do find surprising though is that more of this wonderful wine made from a grape Americans love, Sangiovese, isn’t sold to the United States. Let’s look for a moment at the rules governing Vino Nobile. It be made in the specific vineyards that are registered to produce this stately wine where the soil tends to be sandy and clay-sand mixtures with small pebbles and a high number of fossil materials. It must be made from a minimum of Sangiovese which in Montepulciano is called Prugnolo Gentile. The remaining 30% can be red grapes that are allowed in the legislation or “disciplinare.” The planting density must be 3,300 for new vineyards. Alcohol is 12,5% for Vino Nobile and 13% for Riserva wines. Vino Nobile matures for at least two years following the harvest and three years with at least six months in the bottle for Riserva wines. One of the reasons that I think Nobile isn’t as appreciated as it should be on the United States market is that it tends to be tannic and astringent on the palate when it is young. Nobile is a wine that takes a long time to show its best face, something that those who like immediate gratification have a hard time with. Additionally, most Americans don’t have wine cellars where they can keep a wine for a number of years as it matures. Those that do won’t be disappointed by Vino Nobile which shows its exceptional aromas and flavors with time. 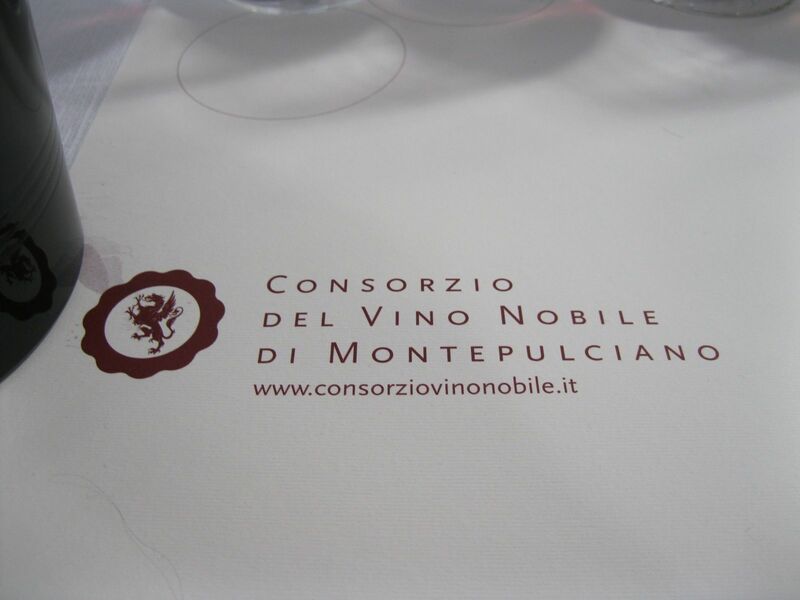 According to the materials from the Consorzio, great years for Vino Nobile were the 2007, 2006, 1999, 1997 1995, 1990, 1988, and 1985 vintages which all got five stars. The last four years 2011, 2010, 2009 and 2008 were considered four star vintages. 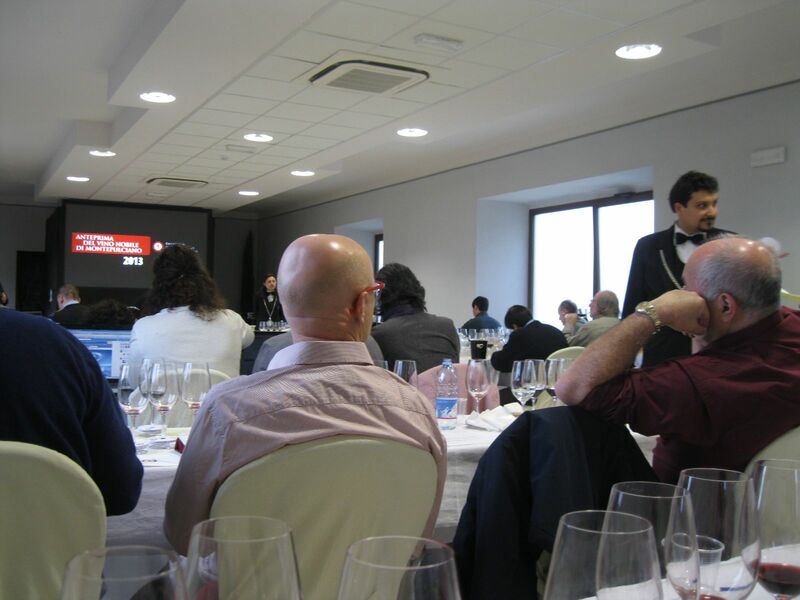 Last year at the Anteprima, we tasted about 64 wines. The event was held in the Fortezza which the Consorzio is also helping to restore. I was excited by the event and didn’t take pictures during the tasting but wrote copious notes. You taste the wines blind with a yellow sheet of paper where you can write your notes and you are also given a sheet with the names of the wineries on them. The first section of the tasting were the 2010s. In general, I found them all to be dark in color with dusty cherry and some floral notes on the nose with spice and oak notes on the palate. Many were very tannic and needed some years to be at their peak. Still others showed considerable alcohol.Thanks to the different grapes that make up the extra 30% of the wine that isn’t Sangiovese, there was a lot of variation in the wine. We then tried a few 2010 “Selezione.” I very much liked the one from Bindella “I Quadri” which had long lasting and harmonious aromas and flavors of fruit, spice cedar, tobacco and liquorice. We then had a number of the 2009s, 2009 “Selezione” and the 2009 Riservas. I was partial to the Tenuta Trerose “Simposia” which had the same dusty cherry, sweet spice notes that I found in the other wines with an extra layer of minerality. I liked a number of the 2009 Riservas very much including ones from Contucci, Corte alla Flora , Fattoria del Cerro, Fattoria La Braccesca – “Santa Pia”, and il Conventino, an organic winery. As a group they were more evolved, after spending a longer time aging before being released. I found them clean with well-integrated fruits and tertiary aromas and flavors. We also tasted the Vino Nobile di Montepulciano 2008 “Selezione” from Salcheto called “Salco Evoluzione.” This is another winery that used organic methods. The 2008 Riservas of Cavalierino, also a winery using organic practices, and Boscarelli also were very much to my palate with fruit, animal and spicy notes. There is so much more to say about Montepulciano as a town, a tourist location, a food lovers paradise, an art lovers city but this post is already very long for the internet. Suffice it to say, put Montepulciano on your schedule for your next Tuscan vacation. The last wines of that day were from 2007. 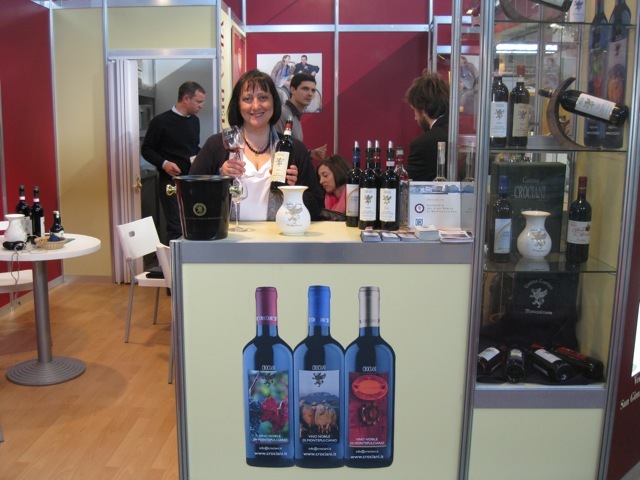 I was partial to the Talosa “Filai Lunghi” and the Fanetti wines, “Selezione” and “Riserva” wines respectively. You can try Montepulciano in the States in March during their 2014 tour, with information listed here. It was I must say, memorable. Cheers and thanks for stopping by at Avvinare. Hi, and thanks for the great info. Saw the Consorzio del vino nobile info in the Wine Spectator magazine. Would you happen to know if there are any more events planned for the US? Would really like to find out, but all roads led me to your blog…which is great news, since now I can follow it! LOL! Thanks for any info you can share. We travel to Italy each year in November, and enjoy the various wine and truffle festivals each time we visit. The more we can learn prior to traveling, the better! Take care, and if you would ever like to consider being a Guest Blogger on either of our blogs, just let me know. Susan/Wade – Thanks for stopping by…I suggest asking the Montepulciano Brand Ambassador. I will try to find her name for you. Cheers!